Click here to view Puppies Available & Upcoming Litters! VON EVMAN ROTTWEILERS is a Code of Ethics Rottweiler breeder. Our goal is to breed healthy, well-tempered, good looking, correct in type, and intelligent Rottweiler puppies. If you study our website, you will find information on ALL of the Rottweilers that we breed. 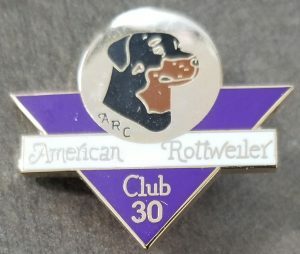 Member of Good Standing Breeder with the American Rottweiler club for over 30 years. 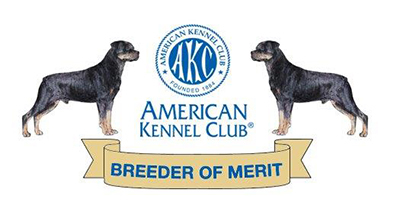 Only a handful of breeders and members in the USA have received this prestigious pin. The adult Rottweilers that we breed have their hips and other parts certified IN AMERICA with the OFA (Orthopedic Foundation for Animals) which is stricter than other countries that certify European Rottweilers and Rottweilers from other Countries. We have the reputation of breeding Rottweilers that have a long life expectancy. Champ, our son, was 15 1/2 years old when he passed which was one of the oldest living Rottweiler ever recorded. Michael Stuckenberger (my husband) was the breeder of Champ in Germany from the famous Vilstaler Land Rottweilers. We breed a certain OLD German Rottweiler bloodline which is one of the purest Rottweiler bloodlines with the least genetic defects. This means that if you adopt one of our children, you will expect to have a healthy Rottweiler puppy through his or her life time. Our Rottweilers excel in all aspects of training and have beauty and brains. Our Rottweiler puppies for sale are from us and co-breeders so the puppies are born in homes and the mothers are spoiled along with the puppies. When you purchase a Rottweiler puppy from Von Evman Rottweilers, be prepared to have a smart, spoiled, and very easy to train puppy. Because of how smart our Rottweilers are many become Registered Therapy Dogs and Service Rottweilers. 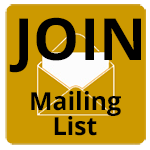 We are a member of several prestigious Rottweiler clubs and organizations such as: AKC (American Kennel Club), ARC (American Rottweiler Club), USRC (United States Rottweiler Club), ARV (American Rottweiler Verein), DVG America, Schutzhund USA, ADRK (German Rottweiler club), Suncoast Rottweiler Club, and Therapy Dogs, Inc.
Our Rottweilers each have their own large fenced-in yard and their own house so they can go inside and out as freely as they wish. The Rottweilers we have in our homes all have doggy doors so they can go in and out of their yards as they wish. 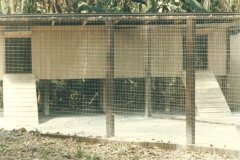 We feel this is healthier environment than other Rottweiler breeders may provide where their Rottweilers are kept inside a building locked up in cages where they can barely move. It is imperative for a Rottweiler to be able to go to the bathroom when they need to and to exercise and play freely all day if they wish. Our Rottweiler bloodline and correct care has proven over the years to be more accurate care since our Rottweilers have a longer life span and are healthier than other Rottweiler breeders. Our Rottweiler puppies and adults spend time in our homes to visit and play during the day and then go back to their own homes to sleep at night. We also have our puppies and adults spend time with us and our employees while working in the front of our property at our plant business learning to be Rottweiler Therapy Dogs and Rottweiler Service Dogs. 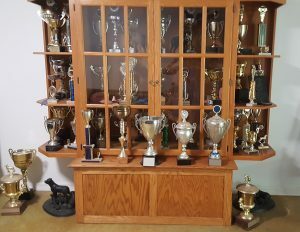 Rottweiler breeding is our hobby and we are able to keep the finest quality in our Rottweiler breeding program unlike others that do it for a living forcing them to do unscrupulous things to pay their bills. Rottweilers are our LOVE, HOBBY, and OUR CHILDREN. Our business is Bonsai Trees and Lucky Bamboo through Eve’s Garden Inc. which supplies Disney World, major Drug Stores, and Supermarkets throughout the United States. Our whelping facility for our Rottweiler puppies is a state of the art complex, separated from the other Rottweiler quarters where the mothers can quietly be very comfortable and deliver their puppies safely. The Rottweiler mothers have an indoor room and outdoor run so they can go in and out as they wish. 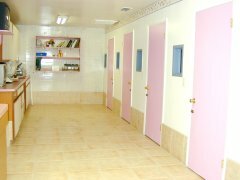 Our whelping facility is designed to resemble a maternity ward decorated in pink and blue. A Veterinarian Laboratory is also in the whelping facility to perform tests on a regular basis to ensure the Rottweiler mothers and puppies health. Someone is with the mother and Rottweiler puppies 24 hours a day watching over them during the first few weeks of their lives. 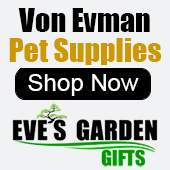 Why Choose Von Evman Rottweilers? Most litters are fully reserved shortly after birth so an early reservation is needed to select the perfect puppy for your home.